"After quasi-plugging her upcoming album The Pink Print, Minaj said, "What I want the world to know about Nicki Minaj is, that when you hear Nicki Minaj spit, Nicki Minaj wrote it." Then she gestured in a way that seemed like she was locking her mouth and mugged at the audience. As the audience cheered, she said, "No, no, no, no, no shade," and smiled at Lil Wayne. The comment about writing her own verses seemed to address rumors that Azalea, who was nominated in the same category as Minaj, employed ghostwriters like T.I., according to Gawker." Minaj then told a story about Lil Wayne making her perfect her verses in the recording studio. 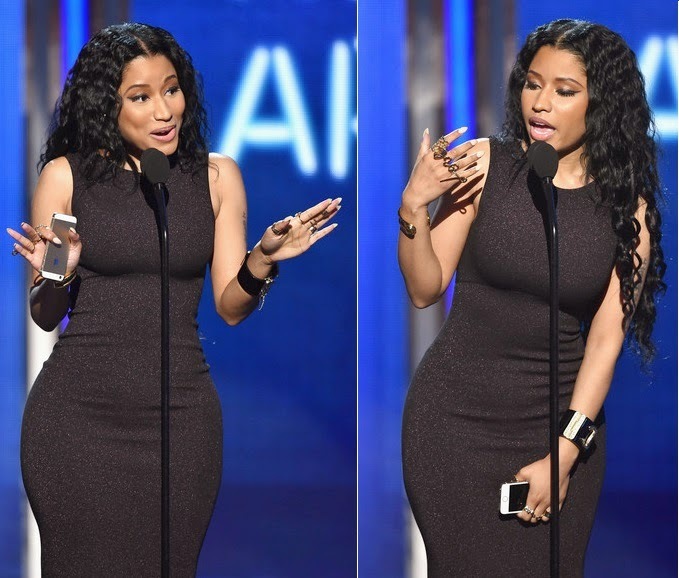 "I'm still the [number one] female MC that's out here spitting metaphors and making you think," Minaj said. "And I really don’t even care if I get my credit or don't." "The other day, literally – I didn't tell anyone this – I really thought I was about to die," she said. "Like I was saying my prayers to die. And I didn't even wanna call the ambulance because I thought, 'Well if I call the ambulance, it's gonna be on TMZ. And I would rather sit there and die...' And it made me realize, 'I don't care what anybody gotta say. I'ma do me.'" As for teasing "The Pink Print" and releasing a surreal video for the ballady "Pills N Potion" in early June, Nicki Minaj's new album does not have an official release date, but is expected to release sometime this year. DID YOU KNOW? Nicki and Iggy's feud ignited back in June 2010, all because of Iggy's reckless use of Twitter....dissing Minaj's BET performance. "LMAO at Nikki saying she did the BET Awards live. Errrr. If you say so girl," she wrote before quickly deleting the tweet -- but not before it was re-tweeted by fans. The tweet however didn't go unnoticed. Nicki responded to Iggy's comment by saying; "Laughing at sh*t u can’t even do … study dat formula … cornball … LMFAO." There was once a time when I could crack jokes, talk about TV shows or whose record I hate and whose I loved etc. on Twitter. I can’t do that now. In part because you guys would make life a nightmare and in part because it would just be unprofessional.